The “Cadillac” of the product line. Can accommodate from 200 — 5000+ cars. A very flexible, modular design for applications above ground, underground, inside a building, on top of a building, under a building. On lot sizes as small as 60’ x 60’. Height (or depth) of as much as 150’. (Ideal footprint 100’ x 200’+ x 48’ — 60’ high). The RPS 1000 is our most versitile and flexible product platform for high-capacity applications. 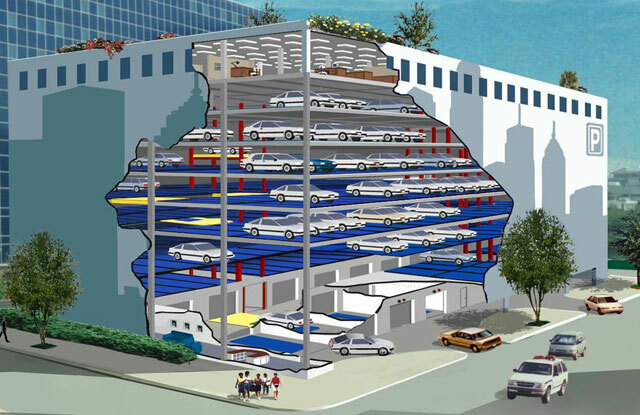 Best suited for development needs that require accomodation of a large number of automobiles.